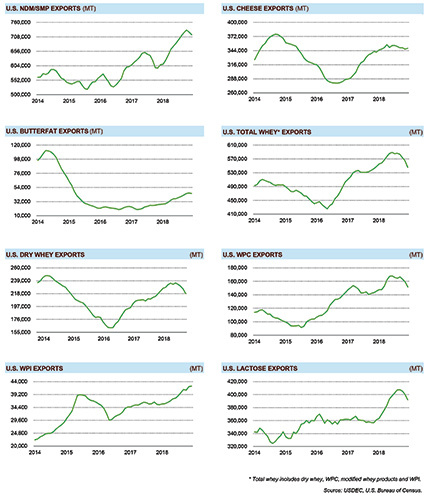 Dairy exports from the United States reached record-high levels in 2018, but volumes slumped in the final months of the year. Exports were down 11 per cent in the fourth quarter, after posting a 16 per cent increase in the first three quarters. Suppliers shipped 152,952 tonne of milk powder, cheese, butterfat, whey products, and lactose in December, the lowest figure in nearly two years, and down 21 per cent from December 2017. The total US exports were worth $428.9 million, down nine per cent. 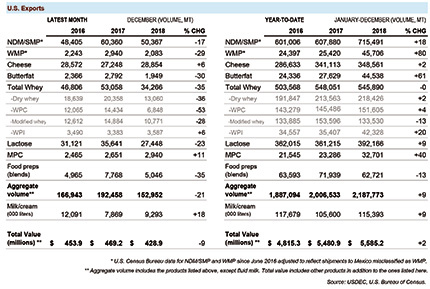 For the year, dairy exports totalled $5.59 billion, two per cent more than 2017, while the overall volume was up nine per cent. On a value basis, sales to China were down 40 per cent in December, while sales to South-East Asia were down 27 per cent. This was only partially offset by a 17 per cent increase in sales to Mexico. US exports of NDM (non-fat dry milk)/SMP (skimmed milk powder) totalled 50,367 tonne in December, a 17 per cent decline vs. the year before. Shipments to Mexico (26,883 tonne, +22 per cent) remained good, but exports to South-East Asia continued to slump, falling to a 15-month low of just 12,167 tonne (-28 per cent). In addition, exports to China, Peru, Pakistan, Japan and the MENA (Middle-East and North Africa) region combined were just 2,393 tonne, down 82 per cent. Whey exports in December were just 34,266 tonne, the lowest in 33 months, and down 35 per cent from the previous year. Total whey exports to China in December were 12,387 tonne, just half of the previous year’s record level. US suppliers were unable to divert lost sales to other markets; December shipments to South-East Asia and Japan were off 23 per cent and 30 per cent, respectively. In the six months since retaliatory tariffs were put in place (i.e., the period between July and December), US whey exports to China were down 39 per cent (-8,078 tonne per month). Cheese exports improved in December to 28,854 tonne, up six per cent from December 2017. Sales increased to Mexico (+12 per cent), South Korea (+18 per cent), Japan (+27 per cent) and the Middle-East/North Africa region (+31 per cent). Lactose exports totalled 27,448 tonne in December, down 23 per cent. Suppliers saw double-digit declines to South-East Asia, China and Mexico. 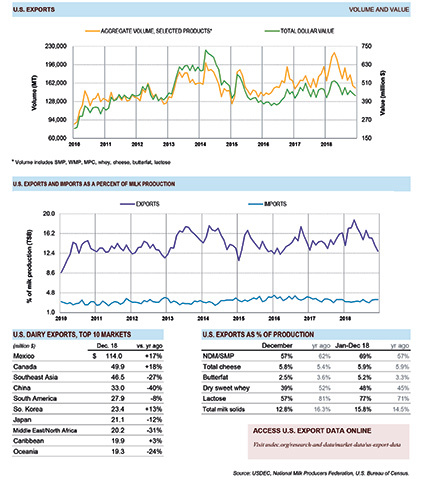 On a total milk solids basis, US exports were equivalent to 12.8 per cent of the US milk production in December, bringing the full-year percentage to 15.8 per cent.